pdeplot(model,'XYData',results.NodalSolution) plots the solution of a model at nodal locations as a colored surface plot using the default 'jet' colormap. pdeplot(model,'XYData',results.Temperature,'ColorMap','hot') plots the temperature at nodal locations for a 2-D thermal analysis model. This syntax creates a colored surface plot using the 'hot' colormap. 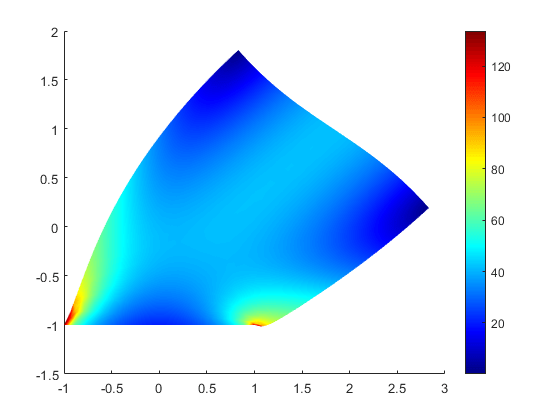 pdeplot(model,'XYData',results.VonMisesStress,'Deformation',results.Displacement) plots the von Mises stress and shows the deformed shape for a 2-D structural analysis model. pdeplot(model,'XYData',results.ModeShapes.ux) plots the x-component of the modal displacement for a 2-D structural modal analysis model. pdeplot(model) plots the mesh specified in model. pdeplot(mesh) plots the mesh defined as a Mesh property of a 2-D model object of type PDEModel. pdeplot(nodes,elements) plots the mesh defined by its nodes and elements. pdeplot(p,e,t) plots the mesh described by p,e, and t.
pdeplot(___,Name,Value) plots the mesh, the data at the nodal locations, or both the mesh and the data, depending on the Name,Value pair arguments. Use any arguments from the previous syntaxes. Specify at least one of the FlowData (vector field plot), XYData (colored surface plot), or ZData (3-D height plot) name-value pairs. Otherwise, pdeplot plots the mesh with no data. You can combine any number of plot types. For a thermal model, you can plot temperature or gradient of temperature. For a structural model, you can plot displacement, stress, strain, and von Mises stress. In addition, you can show the deformed shape and specify the scaling factor for the deformation plot. h = pdeplot(___) returns a handle to a plot, using any of the previous syntaxes. Create a PDE model. Include the geometry of the built-in function lshapeg. Mesh the geometry and plot it. Another approach is to use the nodes and elements of the mesh as input arguments for pdeplot. Display the node labels. Use xlim and ylim to zoom in on particular nodes. 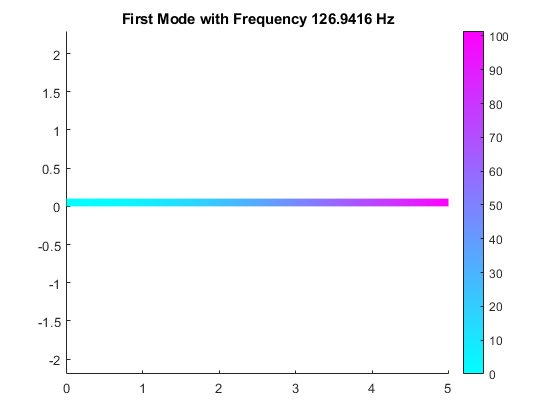 Create colored 2-D and 3-D plots of a solution to a PDE model. Set the zero Dirichlet boundary conditions on all edges. Specify the coefficients and solve the PDE. 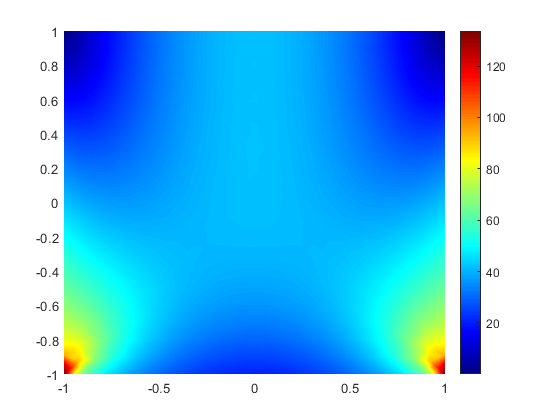 Plot the gradient of a PDE solution as a quiver plot. Specify coefficients and solve the PDE. Access the gradient of the solution at the nodal locations. 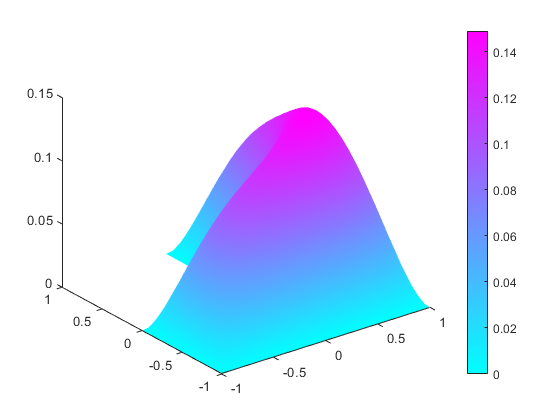 Plot the gradient as a quiver plot. 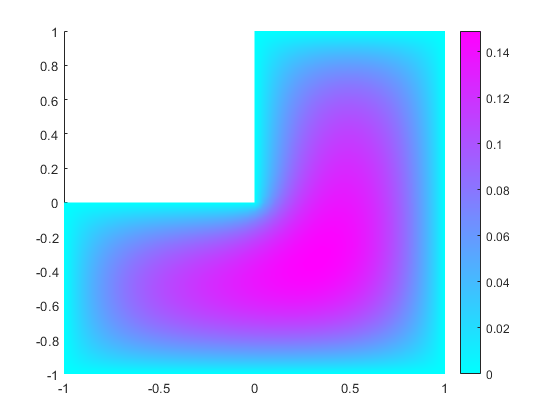 Plot the solution of a 2-D PDE in 3-D with the 'jet' coloring and a mesh, and include a quiver plot. Get handles to the axes objects. Set zero Dirichlet boundary conditions on all edges. Access the solution and its gradient at the nodal locations. Plot the solution in 3-D with the 'jet' coloring and a mesh, and include the gradient as a quiver plot. 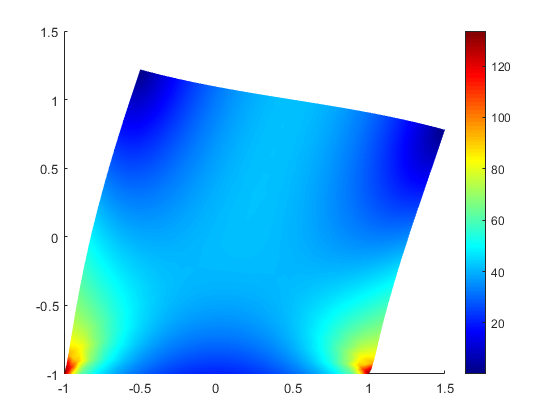 Create a structural analysis model for a static plane-strain problem. 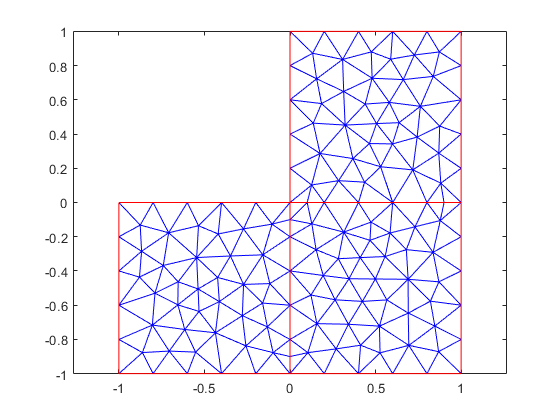 Plot the deformed shape using the default scale factor. By default, pdeplot internally determines the scale factor based on the dimensions of the geometry and the magnitude of deformation. Plot the deformed shape with the scale factor 500. 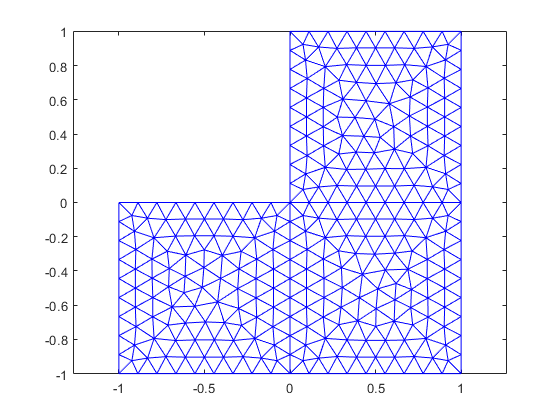 Plot the deformed shape without scaling. 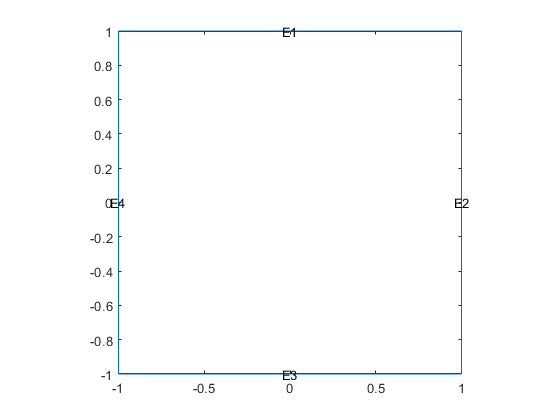 Plot the p,e,t mesh. Display the solution using 2-D and 3-D colored plots. Create the geometry, mesh, boundary conditions, PDE coefficients, and solution. Plot the solution as a 2-D colored plot. 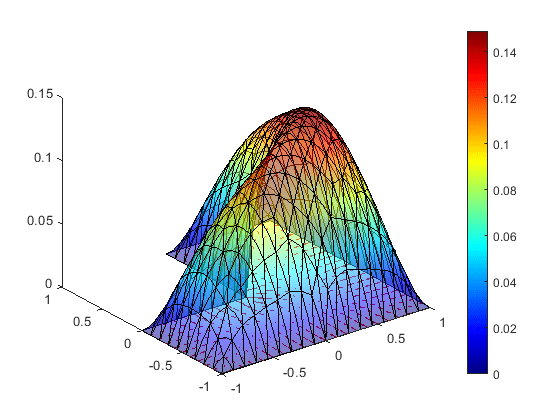 Plot the solution as a 3-D colored plot. 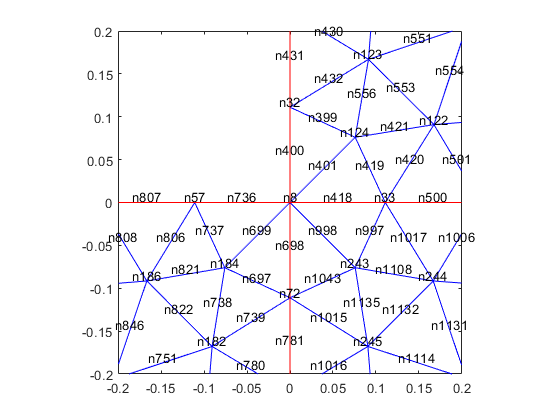 Nodal coordinates, specified as a 2-by-NumNodes matrix. NumNodes is the number of nodes. Element connectivity matrix in terms of the node IDs, specified as a 3-by-NumElements or 6-by-NumElements matrix. Linear meshes contain only corner nodes. For linear meshes, the connectivity matrix has three nodes per 2-D element. Quadratic meshes contain corner nodes and nodes in the middle of each edge of an element. 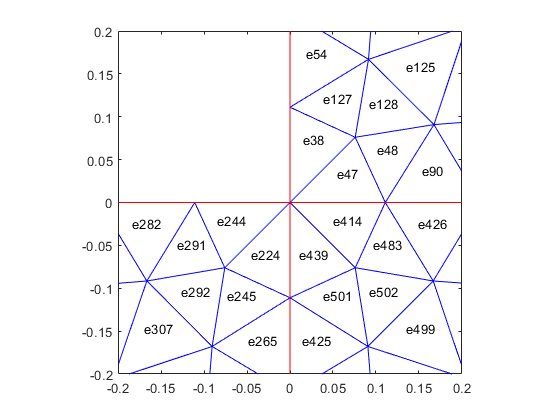 For quadratic meshes, the connectivity matrix has six nodes per 2-D element. When you use a PDEModel object, pdeplot(model,'XYData',u,'ZData',u) sets surface plot coloring to the solution u, and sets the heights for a 3-D plot to u. Here u is a NodalSolution property of the PDE results returned by solvepde or solvepdeeig. When you use a [p,e,t] representation, pdeplot(p,e,t,'XYData',u,'ZData',u) sets surface plot coloring to the solution u and sets the heights for a 3-D plot to the solution u. Here u is a solution returned by a legacy solver, such as assempde. Specify at least one of the FlowData (vector field plot), XYData (colored surface plot), or ZData (3-D height plot) name-value pairs. Otherwise, pdeplot plots the mesh with no data. Colored surface plot data, specified as the comma-separated pair consisting of 'XYData' and a vector. If you use a [p,e,t] representation, specify data for points in a vector of length size(p,2), or specify data for triangles in a vector of length size(t,2). Typically, you set XYData to the solution u. The pdeplot function uses XYData for coloring both 2-D and 3-D plots. pdeplot uses the colormap specified in the ColorMap name-value pair, using the style specified in the XYStyle name-value pair. When the Contour name-value pair is 'on', pdeplot also plots level curves of XYData. pdeplot plots the real part of complex data. Coloring choice, specified as the comma-separated pair consisting of 'XYStyle' and 'interp', 'off', or 'flat'. 'off' — No shading, only mesh is displayed. 'flat' — Each triangle in the mesh has a uniform color. 'interp' — Plot coloring is smoothly interpolated. The coloring choice relates to the XYData name-value pair. Data for the 3-D plot heights, specified as the comma-separated pair consisting of 'ZData' and a matrix. If you use a [p,e,t] representation, provide data for points in a vector of length size(p,2) or data for triangles in a vector of length size(t,2). Typically, you set ZData to u, the solution. The XYData name-value pair sets the coloring of the 3-D plot. The ZStyle name-value pair specifies whether the plot is continuous or discontinuous. 'off' — No 3-D plot. 'discontinuous' — Each triangle in the mesh has a uniform height in a 3-D plot. 'continuous' — 3-D surface plot is continuous. If you use ZStyle without specifying the ZData name-value pair, then pdeplot ignores ZStyle. Data for the quiver plot, specified as the comma-separated pair consisting of 'FlowData' and an M-by-2 matrix, where M is the number of mesh nodes. 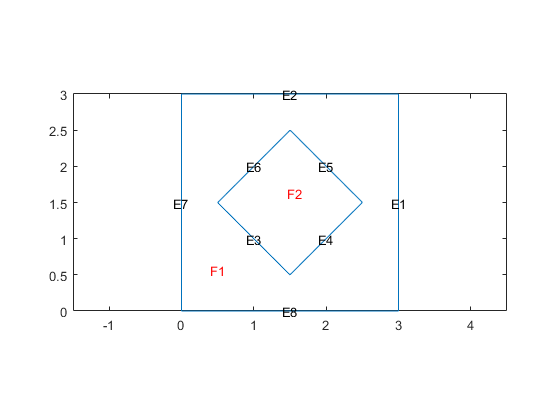 FlowData contains the x and y values of the field at the mesh points. When you use ZData to represent a 2-D PDE solution as a 3-D plot and you also include a quiver plot, the quiver plot appears in the z = 0 plane. Indicator to show the quiver plot, specified as the comma-separated pair consisting of 'FlowStyle' and 'arrow' or 'off'. Here, 'arrow' displays the quiver plot specified by the FlowData name-value pair. Indicator to convert the mesh data to x-y grid before plotting, specified as the comma-separated pair consisting of 'XYGrid' and 'off' or 'on'. This conversion can change the geometry and lessen the quality of the plot. By default, the grid has about sqrt(size(t,2)) elements in each direction. For details on the grid data and its x and y arguments, see tri2grid. The tri2grid function does not work with PDEModel objects. pdeplot ignores NodeLabels when you use it with ZData. pdeplot ignores ElementLabels when you use it with ZData. Data for plotting the deformed shape for a structural analysis model, specified as the comma-separated pair consisting of 'Deformation' and the Displacement property of the StaticStructuralResults object. This property is a structure array with the fields containing displacement components at the nodal locations. Scaling factor for plotting the deformed shape, specified as the comma-separated pair consisting of 'DeformationScaleFactor' and a real number. Use this argument with the Deformation name-value pair. The default value is defined internally, based on the dimensions of the geometry and the magnitude of the deformation. Indicator to include a color bar, specified as the comma-separated pair consisting of 'ColorBar' and 'on' or 'off'. Specify 'on' to display a bar giving the numeric values of colors in the plot. For details, see colorbar. The pdeplot function uses the colormap specified in the ColorMap name-value pair. Colormap, specified as the comma-separated pair consisting of 'ColorMap' and a value representing a built-in colormap, or a colormap matrix. For details, see colormap. ColorMap must be used with the XYData name-value pair. Title of plot, specified as the comma-separated pair consisting of 'Title' and a character vector. Indicator to plot level curves, specified as the comma-separated pair consisting of 'Contour' and 'off' or 'on'. Specify 'on' to plot level curves for the XYData data. Specify the levels with the Levels name-value pair. Levels for contour plot, specified as the comma-separated pair consisting of 'Levels' and a positive integer or a vector of level values. 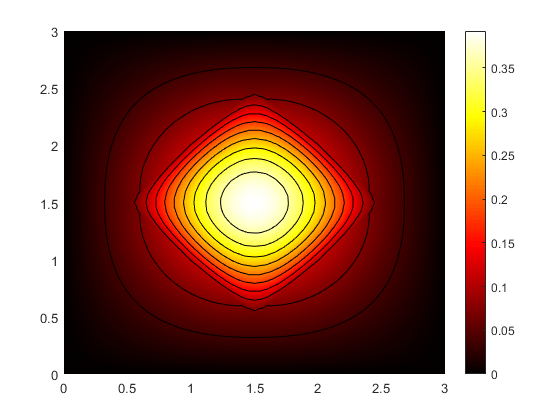 Positive integer — Plot Levels as equally spaced contours. Vector — Plot contours at the values in Levels. To obtain a contour plot, set the Contour name-value pair to 'on'. 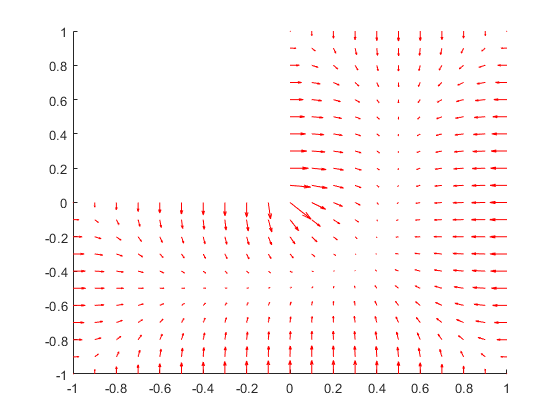 A quiver plot is a plot of a vector field. It is also called a flow plot. Arrows show the direction of the field, with the lengths of the arrows showing the relative sizes of the field strength. For details on quiver plots, see quiver.